Learning Objects Campus Pack, used to provide for blogs, wikis and podcasts in Swansea University’s VLE, was updated at the same time as Blackboard. If you have one or more Learning Objects blog(s), wiki(s) or podcast(s) in your Blackboard (learning portal) module sites, they will be upgraded the first time you or your students visit them. If you have a large number of these installed in a module site, as I have for some of my modules, you may want to do the upgrade before your course is opened for new enrolments. That way, you will avoid confusion for your students and any colleagues you may be sharing a module site with. 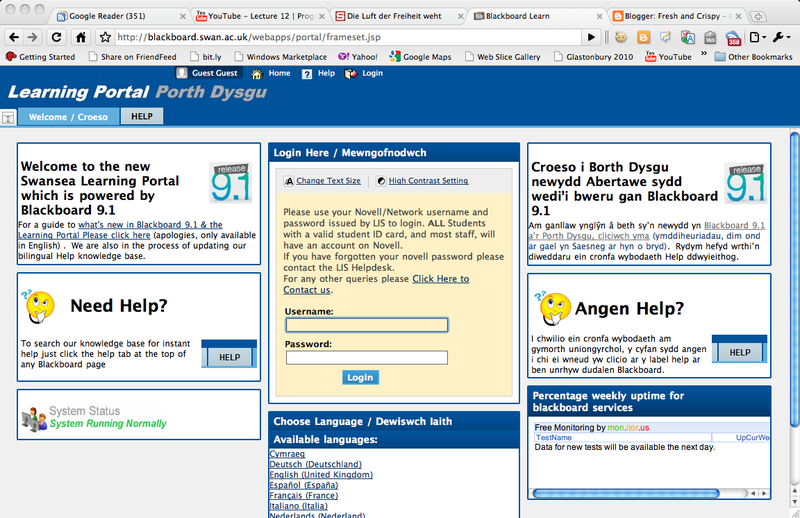 Today is the day when Blackboard 9.1 was rolled out at Swansea University as the new Learning Portal. I haven’t logged in to check my courses yet, but I’m sure they’ll be fine. Clive and his team promised to deliver the update on July 30th, and that’s what they’ve done. I know a lot of planing and work has gone into this and it’s been done with minimum fuss and negative impact. – 2 Free days for late submission of coursework – avoids extensions. Not sure how we could do it all … but there must some of this which has to be worth trying. The video embedded below is hosted on YouTube and can be downloaded and redistributed under a Creative Commons (Attribution-Noncommercial-No Derivative Works) license. [There is a YouTube channel for the whole course](http://www.youtube.com/view_play_list?p=84A56BC7F4A1F852). The follow-on course, [CS106B Programming Abstractions](http://www.stanford.edu/class/cs106b/) (See [YouTube channel for CS106B](http://www.youtube.com/view_play_list?p=FE6E58F856038C69)), was also recorded in the 2008 academic year. The lecturer that year, Julie Zelenski, is also a great performer, but the course is also worth noting because it’s the first example I’ve seen where there’s a Facebook link page embedded in the course web site. This code snippet on calculating the first n Primes using the Python programming language fell into my RSS feed this morning. Very nice I thought, but then it occurred to me, what would be really fast would be to ask the internet. Or more specifically WolframAlpha. So I did: http://www.wolframalpha.com/input/?i=primes+less+than+1,000,000,000. The first 20 of 50,847,324 prime numbers less that 109 are displayed in the internet equivalent of a blink of an eye. One assumes that Mathematica is doing the sums in an efficient way so you get the benefit of expert algorithm knowledge *and* get right to the answer just by asking the obvious question “primes less than 10,000,000,0000″. You also get to know how many of them there are, and if you want, you get a PDF listing them that you can use to wallpaper your room. Prime numbers are very interesting. Wikipedia has a fairly detailed [introduction](http://en.wikipedia.org/wiki/Prime_number). Asking WolframAlpha about “[primes](http://www.wolframalpha.com/input/?i=primes)” gives you some basic information and examples of useful queries and there’s loads of information about Prime Numbers at the Mathematica [Mathworld website](http://mathworld.wolfram.com/PrimeNumber.html). Marcus du Sautoy talks about prime numbers (the “Atoms of Mathematics”) in [this video](http://people.maths.ox.ac.uk/dusautoy/flash/newleft.htm). There are also a number of ways of testing for finding prime numbers using [Prime Factorization](http://mathworld.wolfram.com/PrimeFactorization.html) and many efficient, and less efficient, ways of doing [Prime Factorization with a computer](http://mathworld.wolfram.com/PrimeFactorizationAlgorithms.html). Incidentally, is the Python algorithm really the fastest way? What does *Mathematica* do? Answers, with proofs, in the comments! The O’Reilly Open Source Convention (OSCON 2010) took place last week in Portland Oregon. Videos of the talks are being published on YouTube and Blip.TV. Taken with the convention site, the various related blog postings and twitter feed, there’s lots of useful information. What stood out for me in the video feed was Daniel Recordon’s talk “Today’s Lamp Stack” which describes how Facebook’s has been implemented on the LAMP stack. It’s a talk that will be useful as a learning resource for my course on Web Applications Technology. For ease of access, I include the embeddable version here. The learning message is that there’s a lot more to hosting a big site like Facebook than Linux, Apache, MySQL and PHP! I read a lot of blogs and I listen to a lot of podcasts, so I thought I’d use this blog to tell you about some of my favourites. Here’s the first of an occasional series of recommendations: It’s e-Learning Stuff and the associated e-Learning Stuff podcast from James Clay, ILT & Learning Resources Manager at Gloucestershire College, and 2009 winner of the ALT Learning Technologist of the Year. I am an early adopter and self-confessed geek. I love new technologies and often try to find ways to incorporate them into my teaching (and personal learning). But as an *educator* rather than a *learning technologist*, the bottom line for me is that I want my students to gain value from my experiments with e-learning technology. The technology should not be an end in itself. As such, I’m only on the periphery of the e-learning technology community. A guest, rather than a fully paid up member, if you like. 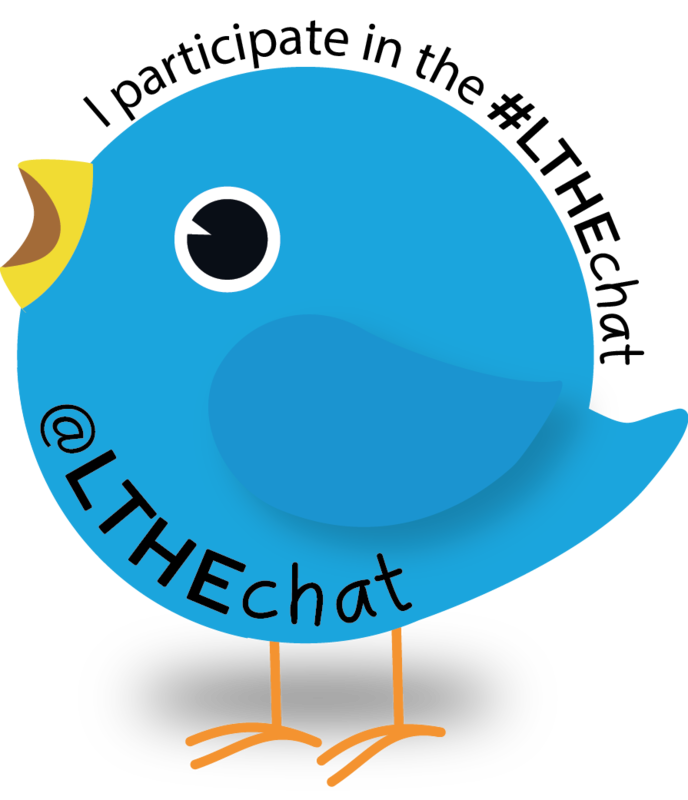 I have a digital identity and a personal learning environment that extends across this blog and my Facebook, Twitter, Posterous and FriendFeed accounts. I aggregate my Google shared items, Buzz, delicious account, Flickr, YouTube, SlideShare and Prezi to my FriendFeed. But despite all this, I still spend a frighteningly large amount of time in the institutional Virtual Learning Environment (Blackboard in our case). I tend to bring resources *into* the VLE on the basis that that’s were I assume students will be coming to find them, rather than trying to work outside it. To the e-learning community, the VLE is like bronze-age technology that should have been made redundant by the dawn of the machine-gun age. But if most HE institutions are anything like mine, bronze-age weaponry is well in advance of the stone-age (should that be *chalk*-age) technologies that most of my colleagues are wedded to. It’s therefore refreshing to find learning technologists who are as pragmatic as James is. Sure, he likes his toys, but he also knows where the real world is at. His blog, especially his posts on [100 ways to use a VLE](http://elearningstuff.wordpress.com/category/100-ways/), is inspiring, and his podcast, usually consisting of a discussion with colleagues from the FE community mixed with the occasional recorded conference keynote, is genuinely interesting. You can, or course, subscribe to the podcast at iTunes. – Blackboard 9 coming soon to Swansea U. – [Delicious Bookmark Browse feature](http://cogdogblog.com/2010/07/07/delicious-browsing/) (thanks to CogDogBlog). Useful for creating a presentation based on web sites. Try this one for resources I’ve collected on [plagiarism](http://delicious.com/browsebar/user/cpjobling/plagiarism). – Open source learning object building toolkit [Xerte](http://www.nottingham.ac.uk/xerte/index.htm) (thanks to Helen Davies at the Swansea Learning Lab). – The [WolframAlpha](http://www.wolframalpha.com/) search engine from Wolfram research (and *Mathematica*). Good introduction and interview with [Conrad Wolfram](http://www.conradwolfram.com/) in the [June 9th Edition of the Guardian Tech Weekly Podcast](http://www.guardian.co.uk/technology/blog/audio/2010/jun/08/apple-iphone-conrad-wolfram-alpha-search). Try: [http://www.wolframalpha.com/input/?i=7+May,+1959](http://www.wolframalpha.com/input/?i=7+May,+1959). – [EduGlu](http://eduglu.com/) — a social network builder for education based on Drupal. Very early stages of development, but one to watch.